A rower is a fantastic workout machine, it works all the major muscles and gives you a full-body workout. There are many models available on the market, so I find it necessary to carefully examine all the best options to find the one that is just right for me. I have read so much about different rowers that I sometimes feel that I am in the process of adopting one and I am carefully preparing myself for a significant life change. Laugh if you must, but thanks to my careful research I can now share with you all that I have learned so that you too can (hopefully) find the child… I mean rower … that you have always been dreaming of. 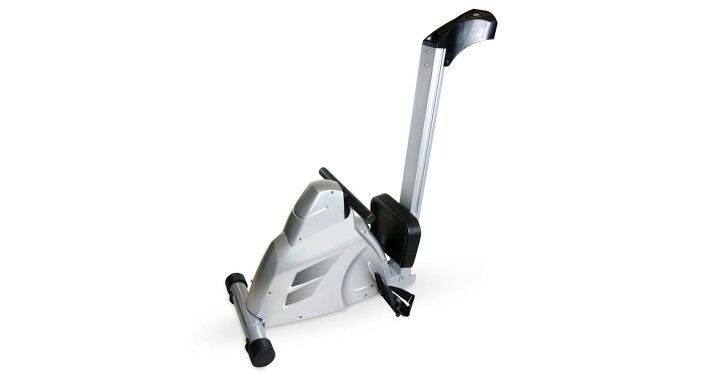 The Velocity Exercise Magnetic Rower has a nice modern look that I find attractive, it folds up nicely for storage and it seems to perform well, as most users were happy with their purchase. Are you curious to know more? Read on to find out what else the Velocity has to offer. 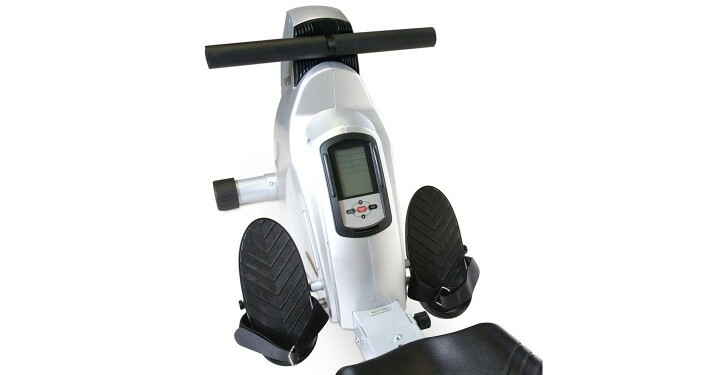 Having a rower with a digital display that will show you statistics like time, number of strokes and distance is beneficial, but when it also comes with preset programs like the Velocity does, I like it even better. 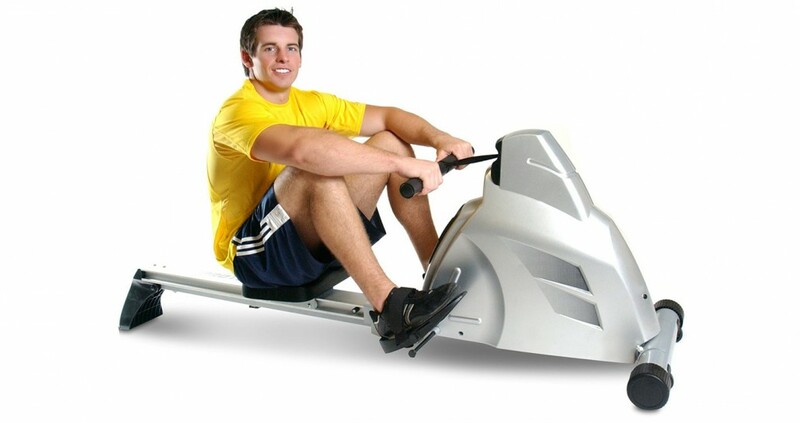 On this rower there are 6 preset programs, not including a heart-rate target and manual program. Plus, you will have the ability to create 4 customized programs to your desired specifications. That’s a lot of programs and I would surely make use of them to make my workouts more interesting and to help me achieve my fitness goals. I can almost see myself using the custom programs to set how many calories I want to burn in each session and feel the sense of gratification that I would get once I reach my goal. Programs on a rower are awesome. The LCD display is large and easy to read, even in dim lighting, because it has a blue backlight. The display on the monitor will show all your workout information on the screen at the same time, so there is no need to switch between screens to get to the information that you want to see. The monitor is conveniently located near the base of the rower, almost between the footrests. 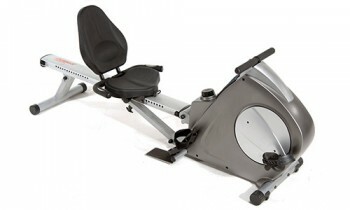 That means that you would be able to see all your stats from your seating position while you are working out. 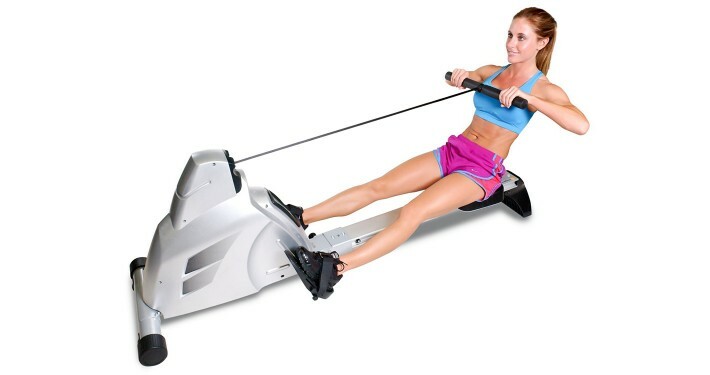 I think it’s great that you get a heart rate monitor chest strap with this rower as well. That is something that you would normally only get with a higher-end rowers, so it came as a pleasant surprise when I found one included with the Velocity Exercise even though it is in the mid-price range of rowers. When you use the included chest belt during your rowing workout, the monitor will use its built-in heart rate receiver to track your heart rate and display it on the screen for you. 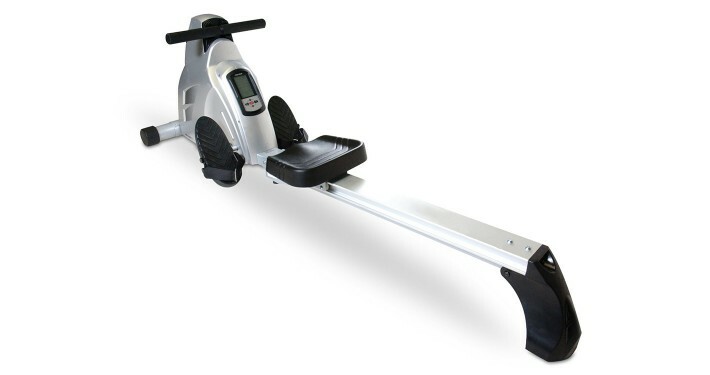 If you have been reading some of my other reviews, you may already know that I like a rower that is quiet so that I can watch TV while I am working out. 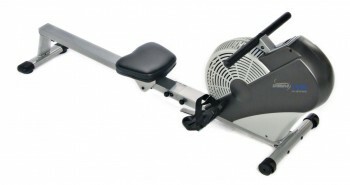 As it turns out, the Velocity is a very quiet rower with a smooth and silent rowing motion. The Drum Magnetic Control system is largely responsible for its quiet operation. 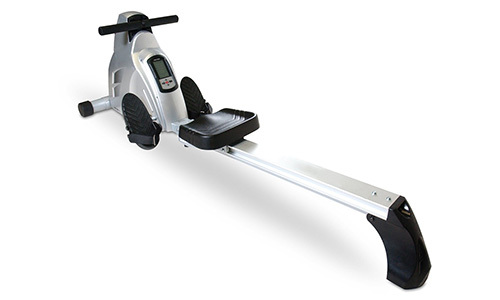 Many users of this rower rave about how quiet it is, so I would say that this is easily one of its best features. 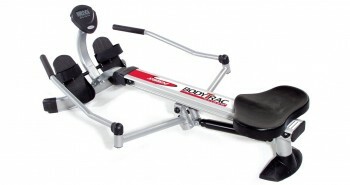 The magnetic resistance also makes it possible to adjust the resistance while you work out. There are 8 adjustable levels of resistance. No, the Velocity Exercise is not a vacuum by any means, but it sure does look like one when it is folded up for storage. That was my first thought when I saw it in its upright position, but the point I am trying to make is that it can be folded and stored just as easily as you would store a vacuum cleaner. To fold it you first remove the knob that holds the seat in place, then fold the seat rail upright and screw it in with the knob that you took out before. That’s pretty simple, if you ask me. 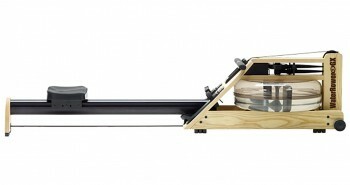 Being able to fold and store your rower is always a plus for people like me who live in smaller spaces. With only a one-year warranty on parts and labor, the manufacturers are not showing much confidence that they have a great product. Rowers that see a lot of use will mostly likely need to have parts replaced or repaired in a year or two, and for this reason I think a one-year warranty just isn’t good enough. Besides, most other rowers have better warranties that are usually at least for two years. I think the manufacturer could do a lot better here. The warranty that you offer says a lot about your product and more customers will buy if they know that they will be covered by a good warranty for a reasonable length of time. The good news is that if you buy it from a retailer like Amazon, you can purchase an optional 2 or 3-year protection for about $50 or $60. 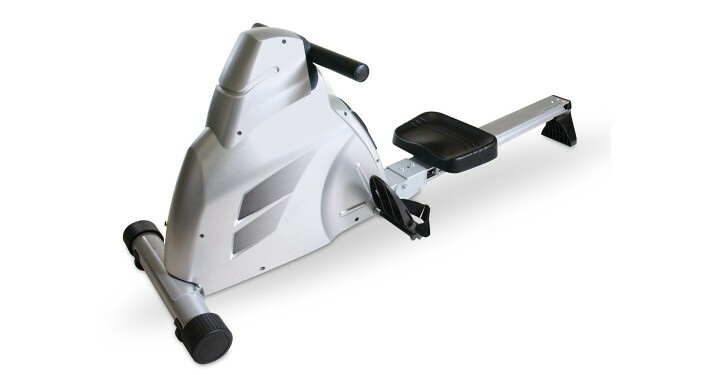 In my humble opinion, the Velocity Exercise Magnetic Rower is a quality rower that looks good when it is stored (if you are into the high-tech vacuum look) as well as when you are using it for your rowing workout. I particularly like the clear monitor display and how silent it is as this makes it perfect for binge-watching my favorite TV shows while working out. 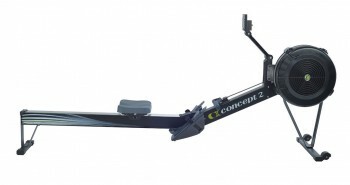 It looks to be a strong and versatile rowing machine that novices and rowing enthusiasts can use to get the results they want. If only the manufacturers would offer a better warranty that more adequately reflects the quality of the machine.